Adding text and images to your website is really easy - like every element on the Venture CMS, it's simply the case of dragging and dropping the element to the page from the left hand column, but we will give you lots hints and tips as to the best way to modify the changes to text and imagery to make your website look great! The text element is located in the 'Basic' section of the column to the left. Simply click and hold the box inside the column and drag it into the area shown below indicated by the blue box. You can then type text into the field. The same principle should be used for Title elements positioned just to the left of the text element in the 'Basic' section. We should mention, we would only suggest using one title element per page, as it may have an effect on your SEO later down the road! After you have written some text using the text element, you can then format it exactly how you want - colour, size, how you want your text aligned, bolded, bullet pointed - or even hyper-linked, using the bar shown below. To change to font family, you can do this by using the design tab of the top of the picture above - we'll talk about this later on though. The image element is located just below the text element and is added to your website in exactly the same way as all of the other elements in the Venture CMS. computer you're working from, a specific URL or one from our stock images - which are free for you to use! You can then re-size the image by dragging the image using the blue square located to the bottom right of the element when hovering over the image - simply click, hold and drag. Venture have an editing package called image perfect which allows you to crop your image, fade it, rotate it - give it a polaroid, burnt or antique look - just some things to make it look a little bit different! All you do to edit your image is click on the image itself and then click 'edit image' when the options box pops up. You can then choose from an array of different options to adjust or tweak the picture you've uploaded. 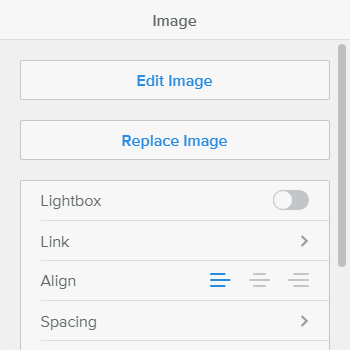 If you want to add an image to a bulk of text that then wraps around it, simply drag an image element directly onto the text you've written and you can either place it to the top right or top left of the text box. In the next section we're going to cover how to alter the layout of a page on your website.